Game maker Valve is threatening to shut down sites that use add-ons for its Counter Strike game to gamble. In all, 23 sites have received "cease and desist" notices from Valve saying they have 10 days to act. It said it would use "all available remedies" against sites that did not stop players using "skins" for characters and weapons to gamble. Valve acted after it faced legal cases alleging that it helped the sites to run gambling operations. The row revolves around the software overlays that change the appearance of the characters people play in Counter Strike: Global Offensive (CSGO) and the weapons and other items they use. 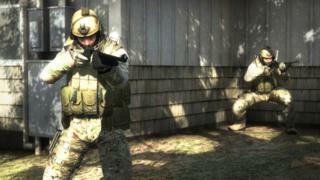 The game involves two teams who take on the role of either terrorists or counter-insurgents and then fight each other for control of the virtual environment or map. Many sites on Valve's Steam gaming service, including the well-known CSGO Lotto and CSGO Lounge sites, let players put skins into an online account, play games to win more skins, and then trade or sell the combined total of skins for cash. Critics, including those who filed the legal cases, said this practice amounted to gambling that was encouraged by Valve's tolerance. Some reports suggest that the gambling economy centred on CSGO is now worth more than $2bn (£1.5bn). The complainants said Valve had not done enough to police the marketplace on the Steam service to stop the gambling. After the legal challenge, Valve issued a statement condemning the sites using Steam to gamble but took no further action. Despite issuing the cease and desist notices, Valve has not said if it will change the way its Steam marketplace works to make it harder for sites to offer rapid trading of in-game extras. The row over CSGO gambling has also led to gaming video site Twitch "indefinitely suspending" the account of James "PhantomL0rd" Varga following allegations that he had not declared his links with one of the sites named by Valve in its warning notices. Mr Varga has more than 1.3 million followers on Twitch and in many videos heavily promoted the CSGO Shuffle site that let people use skins as a surrogate for cash. Attention started to focus on CSGO following news that two prominent gamers, Trevor Martin and Tom Cassell, were promoting the CSGO Lotto website to their viewers, without properly disclosing that they owned and ran it.